to see more information about each subject. You can also scroll down the page to view all subject information that has been posted. Solo Show at Regitz Gallery, Ware Center for Visual and Performing Arts. New - Splash-In! 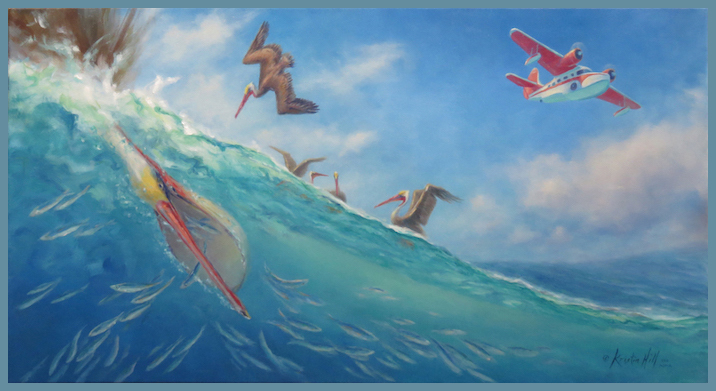 depicts the pelicans and a Grumman Goose with the aqua waters of Catalina Island. Kristin Hill will be exhibiting her art at locations other than EAA AirVenture in 2018. This will be the first time in 41 years that she will not have an official exhibit booth in the AirVenture exhibit hangars. Kristin is always available at Kristin@KristinHillArtist.com. New exhibit venues, shows and artwork subjects will be announced via this website. 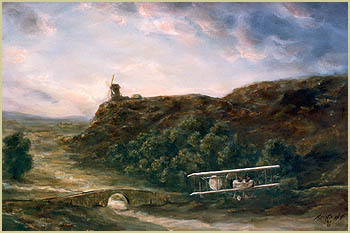 Rembrandt's First Flight  It Happened in 1649. Here's the Story. The "Splash-In" is a float plane gathering, a variation of a "Fly-In" for land loving planes. As an avid snorkeler, I have watched with fascination the pelicans' amazing dives above and below the water surface. They have been doing it for three million years. It is always a delight when snorkeling to hear radial engines and spot a low flying Goose. This will be the first time in 41 years that she will not have an official exhibit booth in the AirVenture exhibit hangars. Kristin is always available at Kristin@KristinHillArtist.com. New exhibit venues, shows and artwork subjects will be announced via this website. Past reference - Visit with aviation artist Kristin Hill at EAA AirVenture 2017! Kristin celebrates her 40th year of exhibition at the EAA AirVenture, Oshkosh. 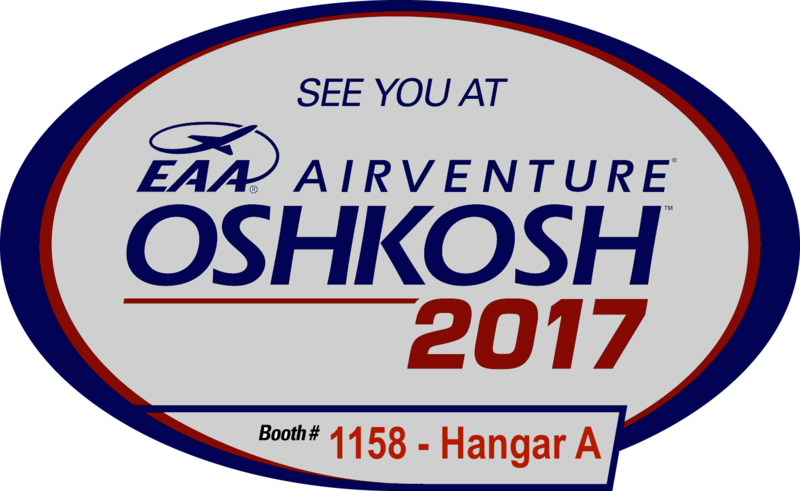 Kristin is available to talk with people at her display in Exhibit Hangar A - Booth 1158, during the July 24-30, 2017 AirVenture event. Long standing friendships and new acquaintances are always a special part of the week of exciting aviation and art. Before and after AirVenture, Kristin can be reached at her studio to discuss how she can create for you a custom commission painting which captures on canvas your individual personal interests in aviation and flight. Kristin's art also is available in the form of already created original paintings, reproductions, and special project arrangements. Own an original work of art! Kristin is working on a new collection of small paintings and sketches and will add to the available selections through the year. Contact Kristin for more information about these and other larger original paintings. Mystery, magic and practical fact merge as curious fellows on the icy airport ramp, challenging our skills of observation to make sense of what we see. The "Iceman" inside his deicing equipment sprays a special glycol mixture on the ice-coated tail surfaces of the Boeing 737. This process assures the aircraft's essential physical aerodynamics are maintained for safe flight. And the Mouse? Of course we all know Mickey and his adventures as the Sorcerer's Apprentice. WestJet and Disney have collaborated to bring us the livery of the "Magic Plane" passenger jet and smiles to warm our hearts.. Within the "Dragon Lady", the U-2 maintainers conduct a thorough review and repair of the venerable high altitude aircraft. U-2 airframes manufactured 30 years ago have several decades of airworthiness remaining because of maintenance regimens and minimal airtime stresses. The jet engine has been removed from this airframe for overhaul. Viewed through the open tail cone, the Dragon Lady's foil heat shields, structural elements, mechanisms, pipes, cables, open panels and dual forward intake vents offer a symphony of visual interplay.. 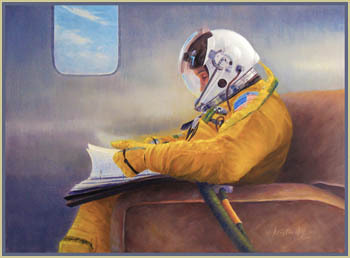 This This painting was inspired by Kristin’s high altitude U-2 flight experience. From within the protection of her own pressure suit while awaiting the walk to the U-2 for the flight, Kristin observed her pilot “checking the forms” that were presented to him. The intensity of the moment was shared with thousands of U-2 sorties and decades of history. 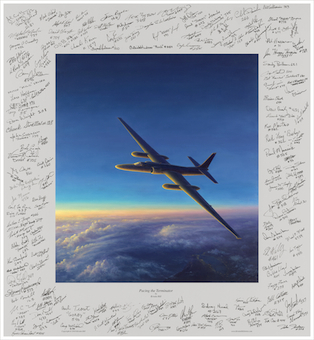 While gathered to recognize the 60th Anniversary of the U-2 Dragon Lady's active service, more than 160 U-2 pilots signed the border of the print Alone with The Forms II for lithographic reproduction. The reproduced U-2 pilots' signatures include call signs and solo numbers which span #10 from 1955 to #978, the most recent U-2 pilot to solo as of mid September, 2015. Each print is in this Limited Edition is hand signed and numbered with pencil by the artist Kristin Hill. Blank space immediately below the image in the title area provides room for additional signatures and recognition statements. The option is available to cover the signature border with a framing mat, if desired. Oil on Canvas 18" x 40"
May 1964 the CIA conducted two top secret reconnaissance flights with the U- 2 to gather information about clandestine French nuclear tests on the Mururoa Atoll, French Polynesia. Select U-2 pilots were trained to be carrier qualified in this high altitude, tandem landing gear aircraft that was known to be difficult to fly and land under any conditions. Following collaborative Naval, Air Force, Skunk Works and CIA preparations, the USS Ranger departed NAS North Island with only mission essential crew and equipment. Two U-2G aircraft, specially modified for carrier take off and landing, flew to the USS Ranger off Hawaii for the one week cruise to a position 800 miles from French Polynesia. 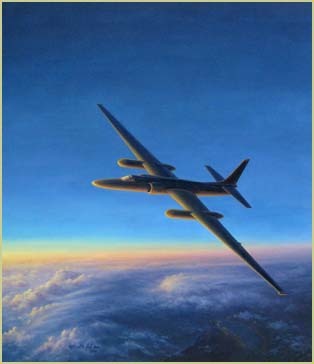 Two successful U-2G reconnaissance flights collected essential information used in cold war diplomatic negotiations. The U-2 and designated pilots remained carrier qualified for ten years. Read more about this historic operation here. Original Oil Painting on Canvas 30" x 40"
1st Reconnaissance Squadron and First Aero Squadron Centennial Heritage is recognized in a Kristin Hill original oil painting with reproduction prints, unveiled at 1 RS Centennial Symposium. The 1st Reconnaissance Squadron is the United States military's oldest flying unit, established as the First Provisional Aero Squadron on 5 March 1913. The squadron has maintained an unbroken heritage from its founding and celebrates its centennial anniversary in 2013. The TU-2S Dragon Lady, T-38 Talon and RQ-4 Global Hawk are currently flown by the 1 RS. The JN-3, Salmson 2A2, B-29, B-47 and SR-71 are five of forty seven airframes flown during its century of service. The First Soars Into the Next Century is available as a Limited Edition reproduction lithographic print, artist signed and numbered. Prints are available through the Beale Liaison Group, sales benefit the 1 RS. More information, larger image and order form are available here. Click images to open enlarged views. 1 RS Centennial Painting Unveiling: Kristin Hill, Col Stewart, Lt Col Rodriguez, David Schmall (left). 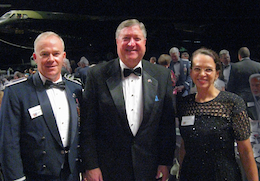 1 RS Centennial Recognition Dinner (right). Oil on Canvas 13" x 18"
This painting was inspired by Kristin’s high altitude U-2 flight experience. From within the protection of her own pressure suit while awaiting the walk to the U-2 for the flight, Kristin observed her pilot “checking the forms” that were presented to him. The intensity of the moment was shared with thousands of U-2 sorties and decades of history. 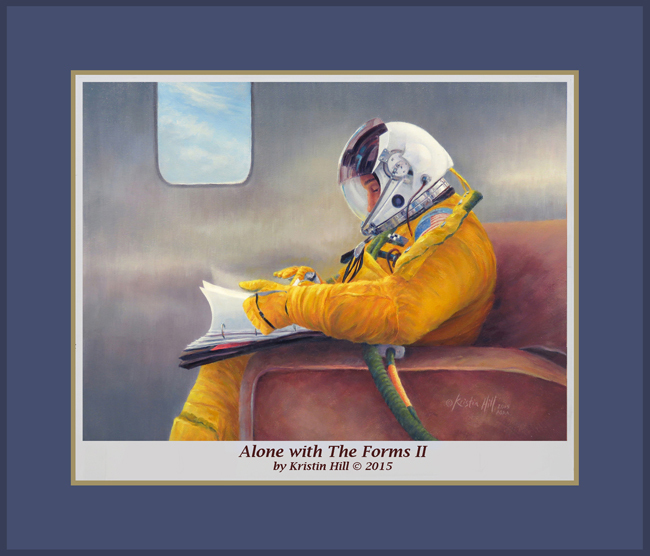 Alone With The Forms receives significant ASAA art award and is on display in the 2012 ASAA International Aerospace Art Exhibit at the Kalamazoo Aviation History Museum - Air Zoo June 3 - September 8, 2012. 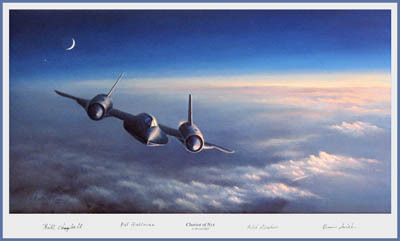 This special Artist Proof Signature Limited Edition of only 30 giclée prints is signed by four renowned SR-71 pilots Lt. General William Campbell, Maj. General Patrick Halloran, Colonel Richard Graham and Lt. 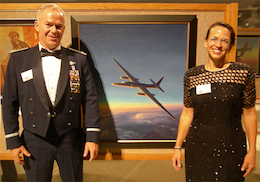 Colonel Bernard Smith and aviation artist Kristin Hill who experienced a high altitude U-2 flight. Read profiles of SR-71 signing pilots here. The Chariot of Nyx special signature print is a President’s Choice auction item in the 2012 EAA AirVenture Gathering of Eagles fundraising gala July 26, 2012. Learn more here. 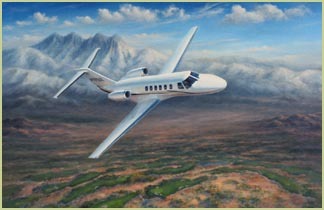 Vectoring from Thor is honored in the 2012 ASAA Retrospective Exhibit of exceptional fine art aviation paintings. 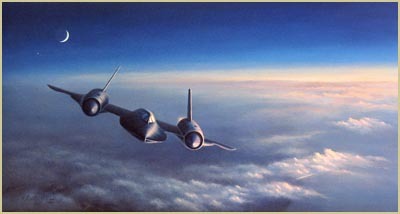 The Art Center of Battle Creek, Michigan features the aviation art collection June 3 - September 8, 2012. The original oil painting depicts business aviation and the decisions pilots address. Captain Francis Gary Powers Silver Star Ceremony at Pentagon Hall of Heroes. 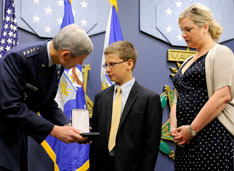 CSAF Gen. Schwartz presents the Silver Star, posthumously awarded to Capt. Francis Gary Powers, to the captain’s grandchildren, Francis Gary “Trey” Powers III and Lindsey Barry. 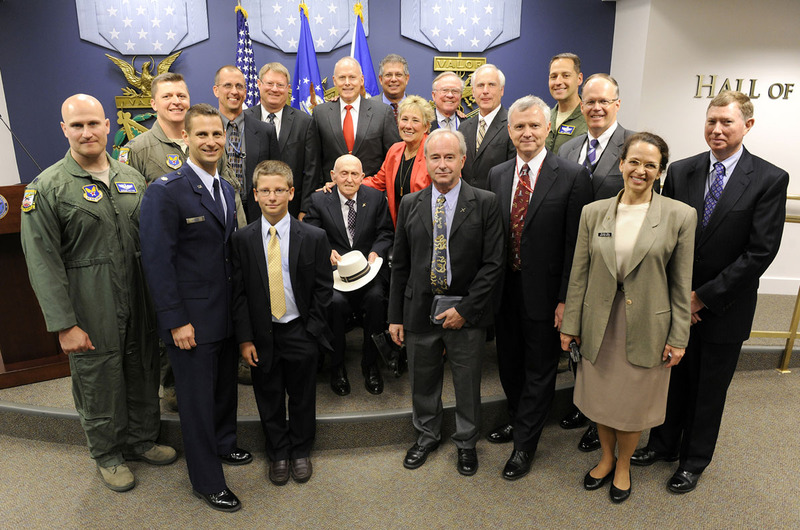 Gary Powers Silver Star Ceremony attending U-2 pilots, Powers family members, U-2 author Chris Pocock and aviation artist Kristin Hill. Click image to open enlarged view. 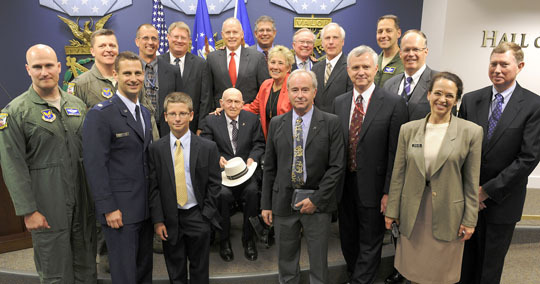 Captain Francis Gary Powers is presented the posthumous Silver Star at a ceremony in the Pentagon Hall of Heroes June 15, 2012. Top Air Force, CIA and other leadership join the ISR and U-2 communities in recognizing Capt. Powers for the heroism he displayed while held prisoner by the Soviets May 1, 1960  February 10, 1962, ensuing the shootdown of his reconnaissance U-2 over the Soviet Union. Following the ceremony, attending U-2 pilots pose with Capt. Powers’ son Gary Powers, Jr., daughter Dee Powers, grandson Trey Powers, U-2 author Chris Pocock and aviation artist Kristin Hill. Carl Overstreet, seated in the photo, was the first U-2 pilot to fly a reconnaissance mission over the Soviet Union. 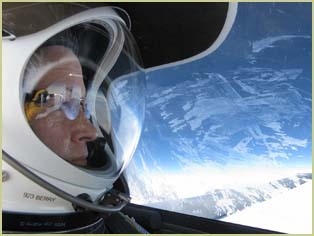 Aviation Artist Kristin Hill flew in the U-2 Dragon Lady, ascending above 70,000 feet to observe this unique aircraft in its high altitude flight environment. The U-2 first flew in August 1955 and is celebrated for its 55 years of valuable service, with several more active years scheduled in the U. S. Air Force. 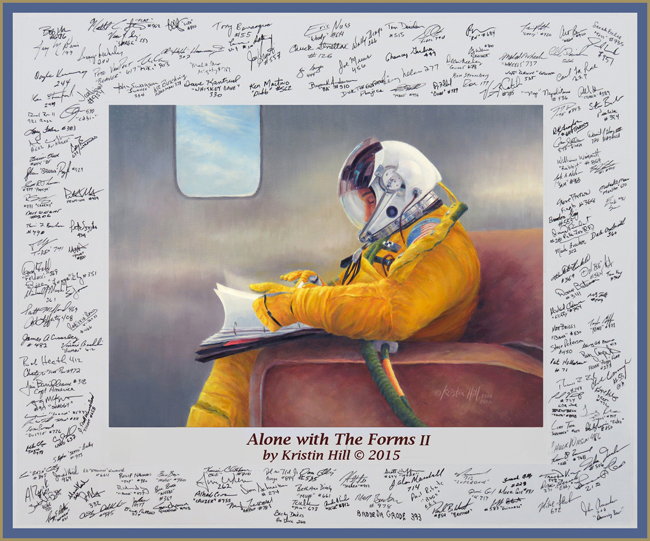 Kristin Hill created her painting Pacing the Terminator following her U-2 flight and additional important research she conducted with assistance from U-2 pilots and support personnel. 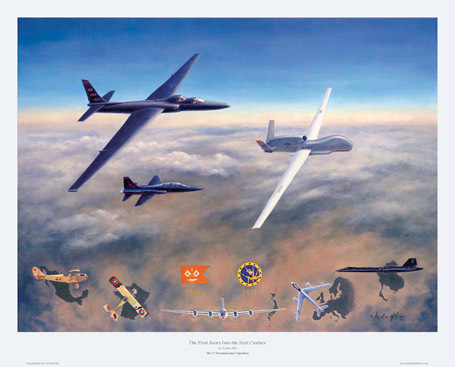 The painting is part of the 55th anniversary recognition of the U-2 and the service of the supporting U-2 service personnel. Pacing the Terminator oil painting officially enters the Air Force Art Collection at the formal presentation dinner held at the National Air Force Museum, Dayton. U-2 pilot Lt Col Jon Huggins represents the 9th RW and joins artist Kristin Hill as Secretary of the Air Force Michael Donley receives the donation. Pacing the Terminator painting is enjoyed by thousands at the National Air Force Museum in 2010 and at Baltimore-Washington International Airport (BWI) Gallery January - July 2011 as part of an Air Force Art Exhibit. At BWI, the painting is seen daily by thousands of people, including our troops who deploy through the BWI airport to destinations worldwide. Kristin’s father Dudley Hill was a Piper dealer who specialized in Comanche aircraft. The 1960 Comanche he purchased new was the family plane for 35 years. 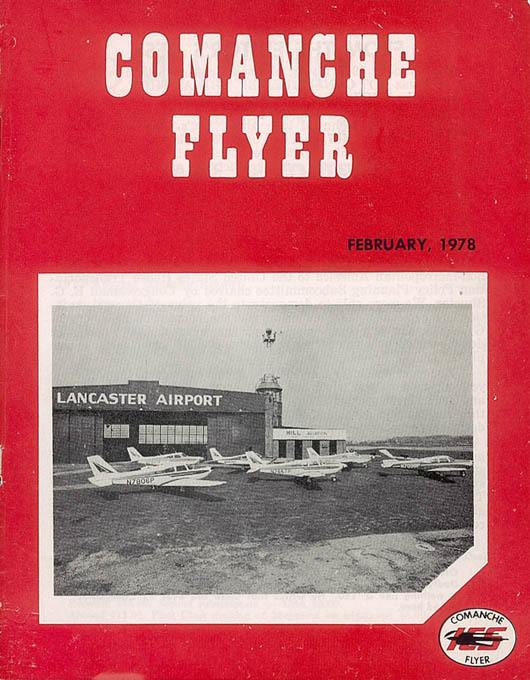 In 1978, Hill Aviation was featured in the International Comanche Society publication Comanche Flyer, the historic cover photo showcases Comanches of Hill Aviation, Lancaster, PA.
Kristin extends a warm welcome to Comanche lovers to commission a painting of their special Comanche and valued memories. The SR-71 races through the skies at Mach 3.5 and 80,000 feet or higher. Revered ancient Greek goddess of night Nyx rides her swift chariot into the night skies. Marta Bohn-Meyer was the only female to crew in the SR-71. As a flight engineer for NASA, she flew backseat in NASA’s SR-71 aircraft and participated in many research projects. 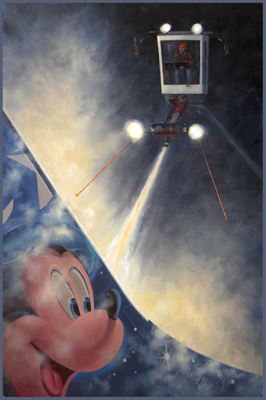 The 20" x 36" oil painting is on exhibit at the San Diego Air and Space Museum as part of the juried ASAA 2010 International Aerospace Art Exhibition, June 6  September 10, 2010. The early airmail pilots pioneered flight routes, weather and aircraft development. May 15, 1918 the first scheduled US Postal Airmail Service was initiated from College Park Airport, Maryland to launch the Washington, Philadelphia, New York mail route. Though the service became routine, the experience for the pilots remained both challenging and rewarding. This “Jenny” pilot flies along the Chesapeake Bay as the weather breaks. The sunlight glows magically through the doped fabric, revealing the wooden structures beneath. This artwork is now available in Limited Edition Giclée Print. The original oil painting of aviation history Airmail’s Pioneers for Progress is a custom commission for a private collector. Another Important Mission received the Walt Jefferies Award: Best Artwork Created at the ASAA Forum 2009. Painting plein air, or directly from the subject, is both enlightening and challenging for the artist. Kristin painted this study of light, color and composition in two hours while observing the City of Savannah B-17 under restoration at the Mighty Eighth Air Force Museum, Savannah, Georgia. The oil painting is 9” x 9” on prepared board. This custom commission painting captures the client’s love of aircraft and flight during an excursion to a favorite desert paradise. Kristin captures these pleasures in an oil painting to be enjoyed every day and for many years. New giclée prints reproduce the brilliance of the popular image Luminous Tranquility. The image is now available as a high quality reproduction on canvas 17” x 30” and hand signed by Kristin. It is also available on heavy paper as an artist signed 250 print limited edition giclée, image 11” x 19”. In the oil painting Winds, Wires & Tales, the day is filled with adventures and explorations as Anne Hopkins wings through air and time in her Great Lakes biplane Nanna. Colonel Chuck Gutekunst, WW II B-17 pilot and aircraft restorer, is her copilot. On this painted day, mysteries of the Tucson desert delight the curious and fill their senses. Adventures from other days can be enjoyed through author Anne Hopkins’ eyes and penned words in her book Sticks & Wires & Cloth. Throughout the book, Anne shares her love of flying, enjoyment of people, zest for life, and talent for “word pictures” that carry readers on the winds of discovery. Learn more about the book and purchase information from the author’s website. The reproduction print and book can be purchased also at Kristin’s painting exhibit booth during EAA AirVenture at Oshkosh. Dew on the wings, wind in your hair, sun on your face, a stick in hand, friends in flight, adventure and inspiration in abundance. The Waco YMF Super and its crew explore the historic Mississippi River today. The first privately funded manned flights into suborbital space were flown aboard the innovative spacecraft SpaceShipOne, designed and developed by Burt Rutan and his team at Scaled Composites. Philanthropist Paul Allen and entrepreneur Sir Richard Branson with Virgin Galactic were major supporters. 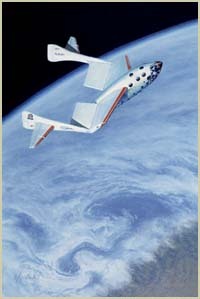 SpaceShipOne was suspended from the uniquely designed turbojet launch aircraft White Knight and released at 46,000 feet. The hybrid rocket motor rapidly propelled the small spacecraft and pilot upward beyond Earth’s atmosphere to weightlessness. There the hinged wings were repositioned to create a feathering effect, allowing the spacecraft to return to Earth gently with minimal speed, friction and heat buildup. Required to fly the three-passenger spacecraft twice in 14 days to an altitude exceeding 100 kilometers or 62 miles to win the Ansari X-Prize, SpaceShipOne was the first to meet and surpassed these requirements by reaching a maximum altitude of 69.6 miles or 367,442 feet on October 4, 2004, thus winning the ten million dollar prize. Kristin’s research and first hand discussions with pilot Brian Binnie resulted in the painting depiction of SpaceShipOne at the apex of its flight. 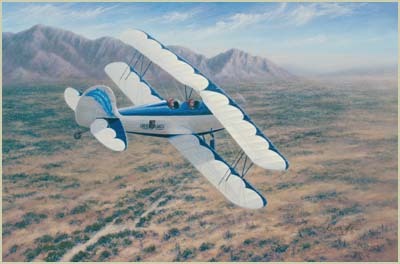 The 20" x 36" oil painting received the 2nd place Open Category Award in the 2006 EAA Sport Aviation Art Competition. The original painting is on display at the EAA Museum, Oshkosh Wisconsin June 2, 2006 through May 11, 2007. Flight is on the feathered wing in the 16" x 32" oil painting Susquehanna Passages which depicts the historic Columbia-Wrightsville, Pennsylvania bridge. This architecturally striking structure, completed and dedicated in 1930, has provided passage to many. On this morning it is visited by sojourners on another passage. Collector Limited Edition Giclée Prints of this beautiful painting are available for purchase for $275. Please contact Kristin Hill for purchase details. The original oil painting Susquehanna Passages was showcased in the Women's Expressions 2005 Exhibition and awarded Second Place. It has been sold as part of this fundraising initiative in support of Health Education. What music would you need to survive if you were suddenly marooned on a desert island? And what one book and one luxury would you select? Those are the questions asked of Kristin Hill as a guest castaway on the popular Public Radio program Desert Island Discs. WITF 89.5's Desert Island Discs host Ellen Hughes asks artist Kristin Hill those questions and many more between excerpts played of each musical selection. Listeners get to know more about Kristin through her music selections, how music influences her art, and how life has influenced her selections. The interview is available on CD by special request. Contact Kristin for details. Rendezvous with Mercury has been on exhibit at the Experimental Aircraft Association Museum as part of the EAA Sport Aviation Art Competition Exhibition, 3 June 2005 through 12 May 2006. 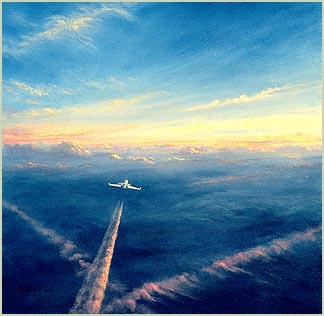 The painting of a Gulfstream business jet in flight in a brilliantly illuminated cloud formation has also been honored as the recipient of the SimuFlite Award in the 2004 SimuFlite Horizons of Flight Exhibit. Rendezvous with Mercury holds the American Society of Aviation Artists / Women in Aviation International Art Award 2002 presented during the prestigious American Society of Aviation Artists Annual International Exhibit, held in 2002 at the Mighty Eighth Heritage Air Force Museum, Savannah, Georgia. Rendezvous with Mercury is now available as a fine art giclée print on canvas, professionally made with the highest quality archival inks and materials. Each 19" x 34" giclée print on canvas is signed by the artist. The original oil painting is also available for purchase. The paths of progress grace the skies as new horizons are explored, aspirations are pursued, and promises are kept. 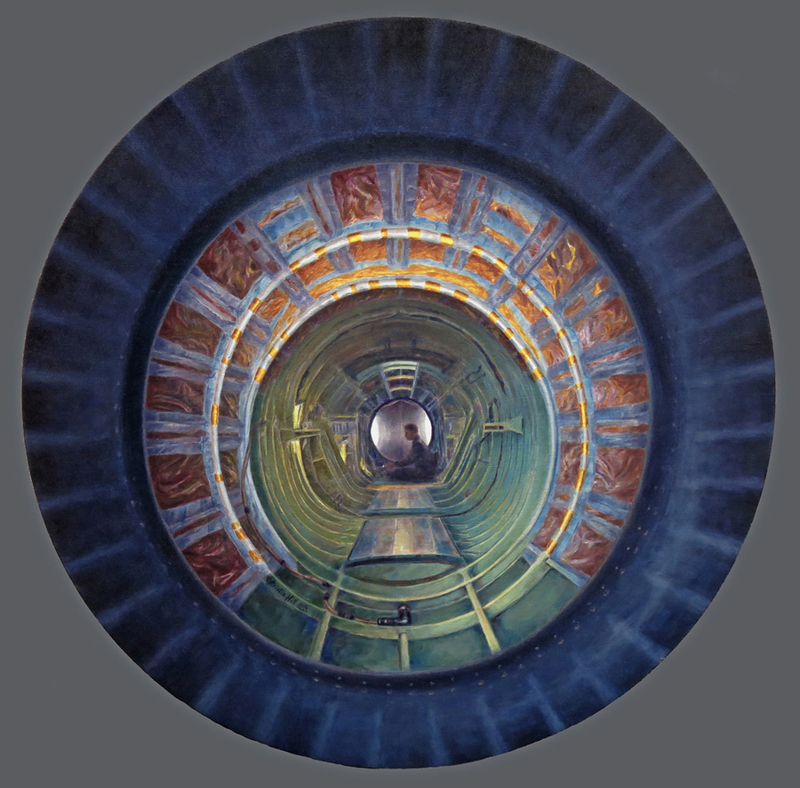 The 24" x 24" oil painting receives an Aviation Week & Space Technology Art Award in the American Society of Aviation Artists 2005 Exhibition, on display June 21 through September 21, 2005 at the Patuxent River Naval Air Museum, Maryland. The work will appear in Aviation Week & Space Technology Magazine's final issue of 2005. 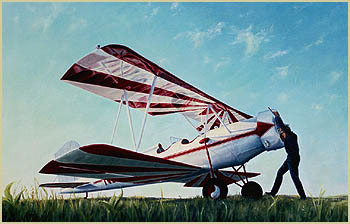 Dudley Hill is propping his 1941 Meyers OTW-125 on a warm spring day in 1982 in this oil painting. Dudley: avid aviator, Fixed Base Operator, Piper dealer, Comanche aficionado, flight instructor, mechanic, dedicated QB, occasional writer, fine husband and father, loyal and fun friend, a gentleman, and yes, a beloved character. where the spirit runs free. where the heart longs to be. 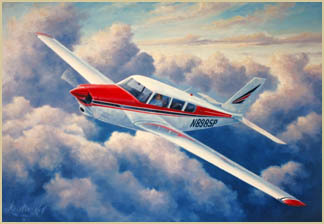 The oil painting on canvas, 20" x 36", depicts a responsibility shared by all pilots. In mythology, the Norse god of thunder Thor and man have a long history of interaction, respect and admiration. The Gulfstream's pilot in command must weigh wisely the forces of nature, technology and man's ambitions. Vectoring from Thor is on exhibit in the 1st Annual 1940 Air Terminal "Civil Aviation in Art" Exhibition, Houston, Texas, July through October 2005. 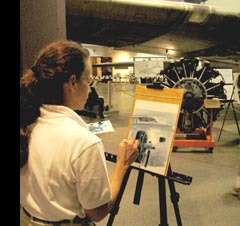 The work was on display at the EAA AirVenture Museum as part of the 2004 EAA Sport Aviation Art Competition, the Lancaster Museum of Art 2002, the American Airlines C.R. Smith Museum in the ASAA 2000 Exhibition, and SimuFlite in the 2000 Horizons of Flight Exhibition. As was usual for him when involved, Rembrandt was painting into the night by the always insufficient candlelight. He thought he heard a knock at the heavy wooden door of the house but chose not to believe it. Soon it was undeniable, as was the fact that all others in the house were asleep. He grumbled as he moved his large body to the door to snarl at the intruder. His curiosity prevented him from being as harsh as he was so easily capable. When his glare fell on the shadowed messenger, he said nothing. The messenger paused, smiled almost imperceptibly and told Rembrandt if he wanted to see his world as he never had before to be at the old windmill just before dawn. He turned and became invisible in a shadow. Rembrandt grunted as he closed the door audibly in the sleepy house. But he was under the old mill an hour before dawn. As he remembered back, he couldn't make logic of the odd sounds from the faintly glowing sky, the peculiar smell of the indefinable contraption soon before him or the inexplicable character whose gaze he could not release. There was one thing certain, though. He had seen an extraordinary world never to be forgotten. It was the same world he had dwelled in and scrutinized for forty-three years, but it was not. Rembrandt never told anyone. He would have told Saskia had she been alive - she would have understood. She would have seen a difference in his spirit after that morning even if he had not told her. The smile that graced his face at somber times was a mystery to many. Oh, what they would never know. Rembrandt's First Flight, Sketch One, 9" x 12" is on display in the Lancaster Museum of Art 2005 Open Art Award Exhibit, June 10 - July 31, 2005 and is recognized with an Honorable Mention. The 20" x 30" oil painting shown here is in a private collection. The past and future of aviation are celebrated as the Wright Flyer accomplishes the first powered flight in 1903 and symbolically wings into the contrail-filled skies of 2003 and beyond. 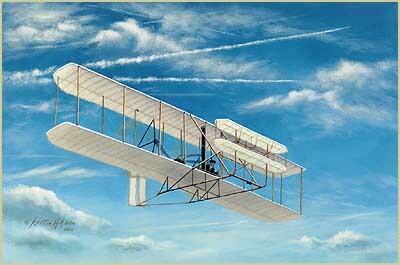 This original oil painting, commissioned in recognition of the centennial of powered flight, is now available in high quality fine art giclée prints on canvas or archival art paper. Special individualized prints can be created, available with a customized line of text stating recognition, printed in the title border beneath the print. These unique prints are excellent for professional awards and personal gifts, acknowledging accomplishments or expressing appreciation. This enduring image is symbolic of aviation in our lives. Kristin Hill’s AOPA 2004 holiday card Playful Holidays depicts the cheerful spirit of fun and laughter. The original oil painting is now held in a private collection. The smaller preliminary color oil sketch is available for purchase, to be accompanied by matching greeting cards for your holiday enjoyment and messages. 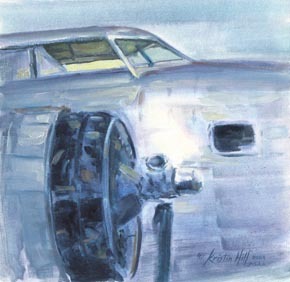 The oil sketch can be viewed at Kristin's EAA AirVenture2005 Exhibit Booth #1158, Exhibit Hangar A. 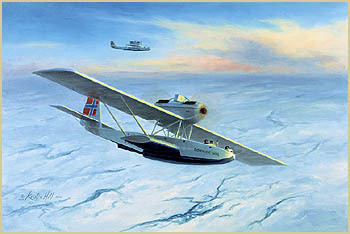 Attempting to be the first to fly to the North Pole, explorers Amundsen, Ellsworth and four others departed Spitzbergen May 21, 1925 in two Dornier-Wal aircraft powered by Rolls-Royce Eagle IX tandem twin engines. Landing 120 miles short of the North Pole after eight hours of flight, they suffered damage to each aircraft. Overcoming mechanical challenges, harsh living conditions, rugged terrain obstacles and several foiled flight attempts, the six men successfully took off in one aircraft twenty-four days later. They returned safely to Spitzbergen and were bestowed great honor for their contributions to polar exploration. 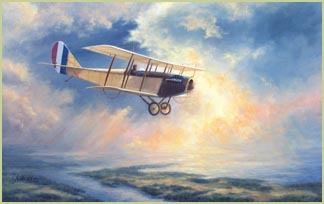 This painting recognizes the first aviation client of Global Aerospace in 1924. Rolls-Royce presented retiring chairman Sir Ralph Robins with the original oil painting My Transatlantic Dream by Kristin Hill in honor of his 47 successful and influential years with the company. 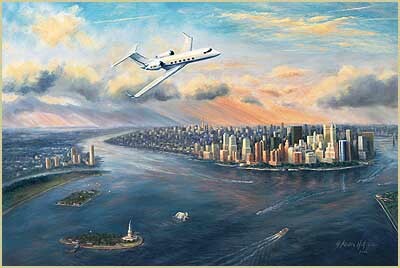 Symbolic of Rolls-Royce’s expansive development of their North American business, the painting portrays the company’s Gulfstream flying over the New York skyline and harbor, the Statue of Liberty, and the expanse of North America in the distance. During a special event honoring Sir Ralph, Kristin Hill unveiled the painting as it was presented to him. My Transatlantic Dream is available for purchase as an exclusively limited fine art giclée on canvas, professionally made with the highest quality archival inks and materials and signed by the artist. 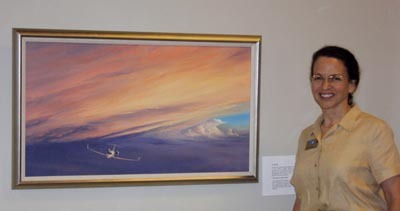 Oil paintings A Brush with Gold and Radiant Raptor by Kristin Hill were among the 80 paintings selected for the prestigious show of aviation art A Retrospective on 100 Years of Powered Flight at the United States Air Force Museum, January through June, 2004. Sponsored by the American Society of Aviation Artists, all artists were welcome to submit work for selection review, with more than 1000 paintings considered. The centennial of flight December 2003 issue of Airport Journals Publications featured the art of Kristin Hill in their 10 United States and Europe magazines and on the covers. 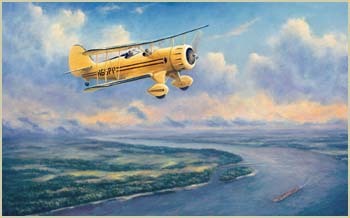 Renowned aviation writer Jack Elliott covered several paintings and events of Kristin’s aviation art career. You can read the article HERE. Kristin Hill holds the highest membership position of Artist Fellow in The American Society of Aviation Artists (ASAA), of which she has been a member since 1987. She held the office of President April, 2006 to June, 2008 and currently serves as Sponsorship Chair. If you are interested in membership in ASAA or would like to offer sponsorship support for ASAA, please feel welcome to contact Kristin for information.